BMW‘s tweener sedan is growing up quickly. Now in its seventh generation, the BMW 5 Series gains a set of more powerful engines, a lighter body, and a brand-new exterior design for the 2017 model year. Equally important, new gesture control technology and semi-autonomous driving features bring it closer to its older brother, the 7 Series. The sedan’s new design more closely resembles the look of other BMW cars. The headlights now connect to the grille, and the lower air vents appear a bit bolder than before. Overall dimensions have changed slightly; the new 5 Series is 1.2 inches longer, 0.3 inch wider, and 0.6 inch taller than the outgoing model. 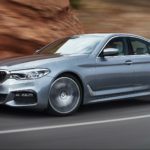 No longer is the 528i the base trim in the 5 Series sedan lineup. That model has been replaced by the 530i, which features a new 2.0-liter inline-four engine making 248 hp and 258 lb-ft of torque. That’s up 8 hp and down 2 lb-ft from the last model. Top speed ranges from 130 and 155 mph, depending on whether or not you opt for the M Sport package, 19-inch M wheels, and mixed performance run-flat tires. Hitting 60 mph takes 6.0 seconds, or 5.8 seconds with all-wheel drive.